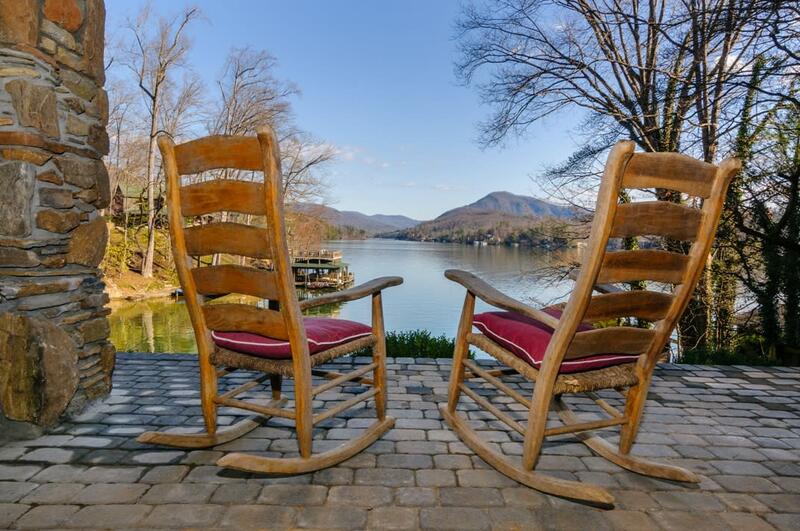 With some of the most beautiful long-range views of Lake Lure and the surrounding mountains, Frick’s Lured In Lake House promises a fantastic mountain lake vacation for large families or groups of friends. So gather the whole gang and come experience one of the most charming houses on the lake. Located slightly off the main channel in a large, deep water cove, Lured In Lake House is perfect for swimming, fishing, or exploring the big water in the 3 kayaks provided for guests' use. Decorated with a fishing cabin theme combined with shabby chic style, this warm and inviting lake house has many cozy and unexpected nooks and crannies so that everyone can find their favorite spot for some alone time to relax or read a book, then come together with the whole family in one of two living areas. The kitchen is exceptionally well equipped with everything you need to prepare a meal, and all bedrooms have sumptuous beds with high quality linens. Awake to jaw dropping views in the very private master suite, fondly dubbed “the nest” by the owners. 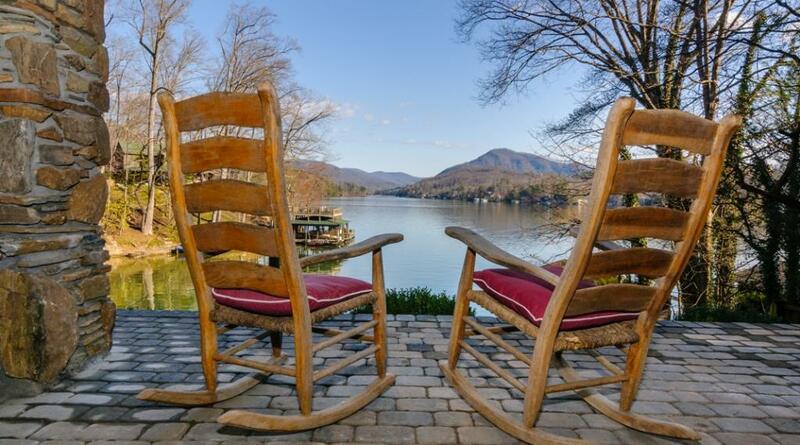 Conveniently located within minutes of Chimney Rock State Park, challenging hiking trails, zip lining and gem mining, Frick’s Lured In Lake House allows you to fill your days with outdoor activities, or claim your spot on the stone terrace, or on the bed swing on the screen porch, and do absolutely nothing. When the crisp fall days arrive and during winter holidays, you can get cozy before the wood burning fireplace in the living area and enjoy the quiet serenity of the lake. Shopping and dining in Chimney Rock Village is only 3 miles away, and lakeside dining is within 2 miles. Or venture out and visit the historic Biltmore Estate in Asheville, which is less than an hour away. This lakefront home is only 17 miles to the Tryon International Equestrian Center where you can enjoy watching or participating in equestrian competitions. Visit our secure website where you can book Frick's Lured In Lake House online.